An international team of marine ecologists has studied the foodweb dynamics and health of eelgrass ecosystems on a global scale. The results show that there is generality in ecology regardless of where the experiments are performed, but also that biologists need to work together in solving large-scale, complex questions in order to obtain cutting edge results. Two professors from Groningen played a part in the study, which was published recently in the prestigious journal Ecology Letters. A big problem for ecologists has been that scientists working on the same problem at different locations can get different results. That doesn’t seem so strange when you study seagrass meadows in Norway or, say, California. After all, there are huge differences in things like temperature, day length and other local conditions, as well as the diversity of species making up the ecosystem. ‘We wanted to explore the issue of generality in ecology’, says University of Groningen professor in molecular ecology, Jeanine Olsen. A network of fifteen labs spanning the Northern hemisphere was established in 2010, called the Zostera Experimental Network (ZEN) , named after the eelgrass Zostera marina. Seagrasses are very sensitive. Overgrowth by algal blooms, for example, can smother the plants and destroy the meadows. This can have serious consequences, as the eelgrass forms a nursery for many fish species and helps to protect from coastal erosion. 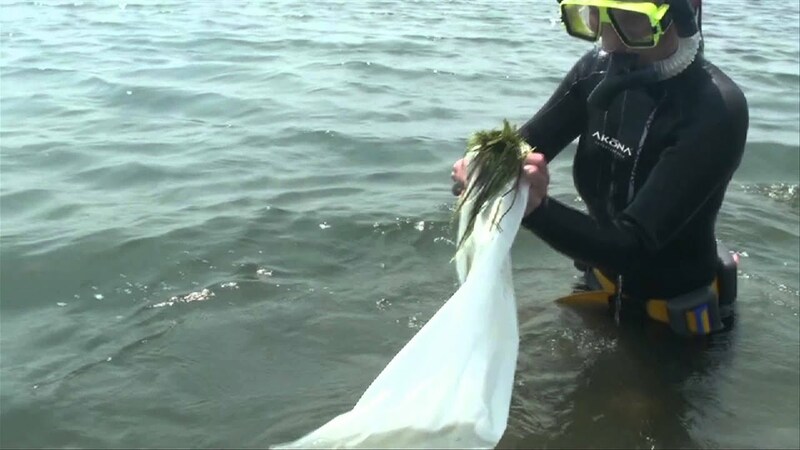 The fifteen collaborating labs (with about 100 researchers in the field) devised an experiment to test the importance of ‘bottom up’ and ‘top down’ effects on eelgrass meadows. ‘Traditional wisdom said that nutrient loading from runoff from the land or other source stimulated growth of algae on the eelgrass leaves’, explains Olsen. This is so-called bottom-up control of the food web can play role in some cases. But there’s more to the story. Moving up through the food web, small and medium size ‘grazers’, such as tiny crustacean isopods, keep the algae on the eelgrass leaves mowed down. At the next level up, small fish such as sticklebacks eat the mesograzers and, in turn the larger fish eat the small fish. Predatory fish are at the top of the food web. ‘About ten years ago, Britas-Klemens Eriksson, who is also a professor and experimental community ecologist here in Groningen, came up with a different idea’, says Olsen. Eriksson and colleagues published an influential paper describing the importance of the big fish at the top of the food web. They were able to show that removal of fish through fishing pressure led to an increase in sticklebacks, who then ate more of the small mesograzers. ‘And once the “cleaners” were gone, the eelgrass became overgrown with algae.’ Here was an example of top-down control. The scientists excluded the grazers by using a chemical repellant (with appropriate permits) in combination with fertilizer addition in all four combinations. Predictably, when grazers were reduced and nutrients increased, algal growth increased. However, an increase in nutrients alone with grazers present had little effect. The most important variable was diversity of the mesograzers, even though the diversity was comprised of different groups of species at each location and that corrections were made for temperature, latitude and so forth. Mathematical modelling showed that the extent of the algal blooms correlated with the biodiversity of the meso grazers. ‘Loss of grazer biodiversity made the eelgrass more vulnerable to a major disturbance and likewise it was found that the genetic diversity of the eelgrass plants themselves also affected the the species level diversity of the mesograzers’, says Olsen.’ So the work of Eriksson, who led the field work at the Northern Norway ZEN site and who played an important role in the subsequent data analysis, is confirmed. Apart from the results, ZEN network has made another important point, says Olsen. ‘This type of collaborative work is really the way forward in ecological research. It is vital to have a team that includes people with different expertise and to be able to work in different locations.’ Scale and replication are extremely important as are the synergisms that develop through team science. Last modified: 04 October 2017 4.53 p.m.